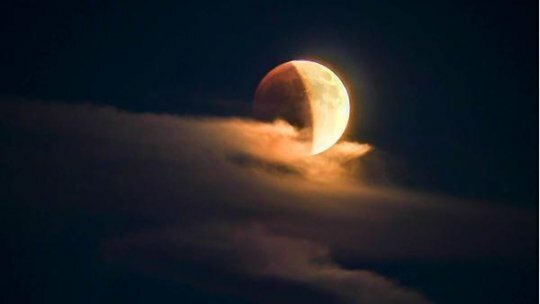 It was so clever of ABC to schedule the premiere of Dark Swan on the evening of the Super Blood Moon Lunar Eclipse! We start with Camelot, in two realms. In the land of no magic, in the year of Taylor Swift’s birth, Little Emma watches Disney’s animated King Arthur film The Sword in the Stone (based on the first part of T.H. White’s Once and Future King and to this day I wish they’d done the whole trilogy). She’s approached by an enigmatic (/spooky) usher (/wizard) who’s fine with her stealing candy but warns her off touching Excalibur. Then he disappears. Little Emma makes a face like “Hmm, I wonder if this is a portent of things to come i.e. my entire life is a story being manipulated by forces of both good and evil because I am secretly a princess and now maybe heir to Camelot some which way except possibly I am in Mordred’s role, hmm” but she shrugs it off and goes back to her candy. In the land of magic, four knights approach the sword in the stone. He who is not Arthur attempts to pull the stone so he can become King of Everything and is instantly turned to dust. Oop. He who is Arthur steps up and successfully draws the sword but — dun dun dun — it’s broken. Where’s Excalibur’s tip? What I get out of this is Emma is Aragorn. We’re now in the present, with Emma’s nearest and dearest. They fall into bickering amongst themselves immediately — especially Hook and Regina who spend the entire episode arguing about how to go about saving Emma. Snow spends the entire episode trying to be everybody’s mom and force the fractured family into working together. Charming spends the entire episode wondering what’s going on. 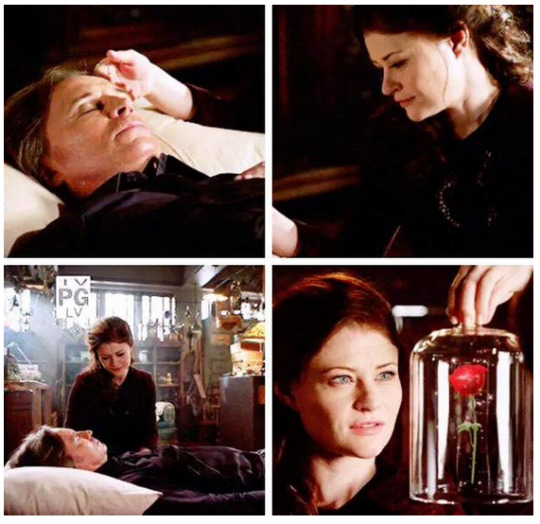 Since they aren’t able to summon Emma via dagger, they head over to Mickey’s death bed to learn how to proceed. With his last gasps of life (probably?) he hands them (one of?) Merlin’s super-powerful wand(s?) to use to create a portal to wherever Emma is. I’ve lost count of how many different ways there are to create portals but I think this one is actually recycled? Anyway the wand or the spell or both, Idk, requires both light and dark magic to work so it can only be used by a dark magic user. Regina takes that to mean her but it doesn’t work cuz she’s too good and pure, heroic and light, now. Hook lords this over her like it’s a bad thing and then twists the knife in deeper by suggesting they need Zelena to do it. None of this is even remotely surprising. Hook, Regina, and Robin visit Zelena’s padded cell where she exposits about how the wand works (she knows this how?) but Regina and Robin aren’t ready to work with the woman who admits to manipulating her pregnancy without Robin’s consent. Hook, on the other hand, is desperate to both find Emma and prove he cares more about finding Emma than Regina does. So he enlists Henry into breaking Zelena out. That goes exactly as well as expected — Zelena gets free, gets the super powerful magic wand, and bounces on Hook cuz she has exactly zero interest in helping anyone except herself (Hook is the worst at plans). Zelena pops over to the Charmings apartment where apparently Robin and Roland are now staying (everyone lives in the Charmings apartment, I want a comic book just about their daily domesticism that must include a sleep schedule because there just aren’t enough beds for everyone who lives there). She gets herself a Robin hostage just as the rest of Team Dysfunction becomes aware of Hook and Henry’s folly and run into the street because all the best confrontations take place in the street. Zelena demands the wand for Robin and despite vocal objections from the rest of TD, Regina gives in. Zelena opens a portal to Oz because she remembers reigning over it with fondness and also everyone in Storybrooke is awful. It’s actually a pretty good idea on her part — she escapes the crazy, returns to the closest she’s got to a home, and gives herself the potential to build a family with her baby far from the kid’s father she doesn’t care about and the sister she’d be in constant competition with. But it’s not to be because turns out Regina was counting on her opening the portal and has figured how to steal it for their own use. She also recaptures Zelena and pops the de-magicing bracelet back on so she can’t do anything about it (Regina is best at plans). So TD takes over Granny’s and Regina uses Emma’s baby blanket to redirect Zelena’s tornado into dropping the Diner where Emma went. Regina, Zelena, Hook, Henry, Snow, Charming, Baby Neal, Robin and Roland are joined by Granny, Grumpy, and another dwarf because the minor characters wanna be a part of the main plot for once (#RubyisComing). Also Belle who is allegedly a part of the A plot but never gets to do anything, #sadface. … but I love callbacks like this. And Blue even called him her ‘beast’! So they all cyclone over to Camelot. 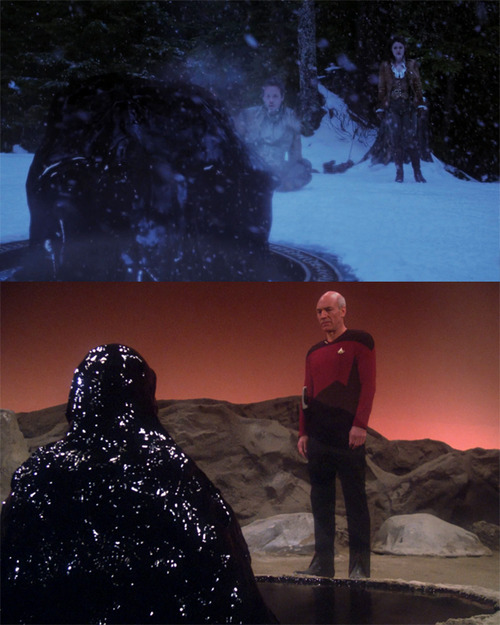 Meanwhile in the Enchanted Forest, the tar monster that killed Tasha Yar and Neal spits Emma out of a well. She’s met by a manifestation of the most recent Dark One, Rumplestiltskin, who haunts Emma for the entire episode and probably the entire half season. He suggests, cajoles, demands, guilts, and pushes her to use her Dark One Power to do everything from teleport to murder that cute redhead. Merida is my ten year old daughter’s favorite Disney Princess and she is living up to her promise so far. I am kinda devastated that Merida’s dad is dead! And the kingdom is is disarray! Because they won’t accept a woman leader! But I hope it means that Merida plays a big role in the story because that lines up with Cameplot rather well? Anyways, Emma meets Merida and they parley and decide to share the magic wisp that Merida claims to need to save her brothers and her kingdom but Head!Rumple claims Emma needs to find Merlin and remove her darkness (WHY DOES SHE TRUST THE OTHER DARK ONE WRT TO ANYTHING HAVING TO DO WITH GETTING RID OF DARKNESS HE DOES NOT WANT HER TO REMOVE IT OBVIOUSLY ALSO WHY DOES ANYONE EVER TRUST RUMPLETSTILTSKIN OR MANIFESTATIONS THEREOF?????). But Head!Rumple tells Emma they can’t share and she has to kill Merida and take the wisp. Merida overhears Emma talking to someone only she can hear and see and bounces obvi. 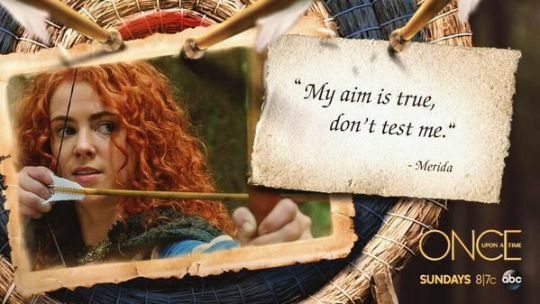 Emma tracks her down and much to Head!Rumple’s chagrin continues to try to negotiate her way into Merida’s good graces/sympathy and gain possession of the wisp but Merida is convinced she’s a cray cray witch and starts shooting arrows at her. Emma plucks the arrows away as it speeds towards her and turns darker with each one. She steals Merida’s heart out of her chest and prepares to crush it. But the calvary arrive just in time to talk her down. Hook takes the lead but Snow encourages her to remember she’s better than this and Regina encourages her to remember giving in to the dark side is not worth it. 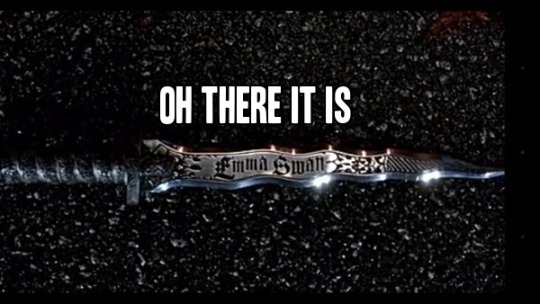 Crisis averted the Charmings hand over the dagger as a gesture of their faith in Emma. But Emma gives it to Regina instead, and asks her to save her, and if she can’t, destroy her. What I get out of this is Regina is Wolverine. TD bring Emma back to where Granny’s landed just in time for the lot of them to be met by King Arthur and his knights per Merlin’s prophecy. Emma is briefly reminded of that time a weird usher told her to leave Excalibur alone but shrugs it off. They all parade into the castle and it’s lovely. Six weeks later Granny’s is cycloned back to Storybrooke. Team Dysfunction are dressed in pretty pretty Camelot clothes but remember nothing that happened since that lovely parade. That’s right, their memories are missing again. Not good since a leather clad, platinum haired Emma appears with the news it’s all over, they failed, she’s the Dark One and she has the dagger. This is a familiar ending/beginning and it’s fair to say that’s tedious. But I’ve decided to look at it as an integral part of the story being told. The series’ intent is to play with stories that are familiar but also have been told and retold over and over in many different ways and by many different people. Adaptations of adaptations. They overlap because the roots are the same, but the branches twist and turn and transform. The showrunners clearly have a preferred formula, I’m gonna take a page from Maleficent and stop wishing it was different. I’ll let you know how it goes.